A new study has found that portable pools may be more of a safety risk than many parents realize. Researchers from the Center for Injury Research and Policy of The Research Institute at Nationwide Children’s Hospital found that every 5 days a child drowns in a portable pool during the summer in the United States. These pools include wading pools, inflatable pools and soft-sided, self-rising pools. The majority of cases in the study, which looked at both fatal and non-fatal incidents, involved children under 5 years of age (94 percent), pools in the child’s own yard (73 percent) and occurred during the summer months (81 percent). 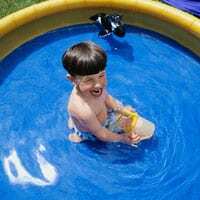 While supervision by an adult when children are in a pool is important, it is not enough: More than 40 percent of the children in this study were being supervised by an adult at the time. In 18 percent of cases, a brief lapse in supervision, such as socializing with neighbors, answering the telephone and doing chores, was enough to allow an accident to occur. Multiple layers of safety protection should be used to prevent portable pool drownings, including measures to prevent children from accessing pools when adults are not present, keeping children safe during use and being prepared to respond if an injury does occur.